Discover the majesty of Niagara Falls on this day trip from Boston. Less than 60 minutes is the flight time for a trip from Boston to Niagara, where you'll enjoy fun-filled sightseeing shopping, dining and touring. Your trip includes lunch, airfare, transfers at Niagara Falls and tickets to the famous Maid of the Mist sightseeing cruise. Niagara Falls is simply amazing. The powerful combination of 3 separate waterfalls that make up Niagara must be experienced in person to realize their magnificence. 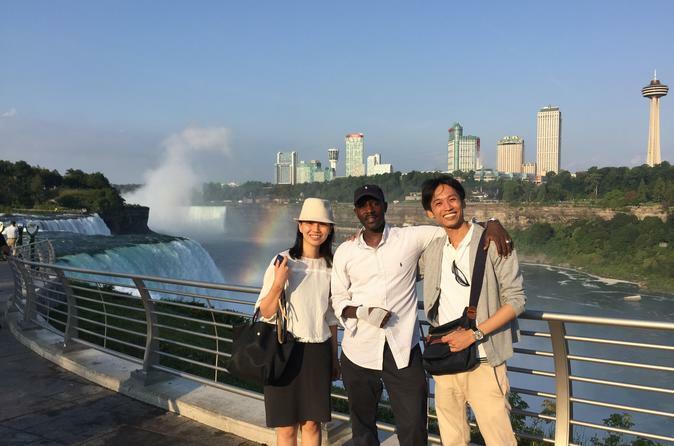 On this self-guided day trip, you will take a 1 hour flight from Boston to Niagara Falls, USA. Before your in-flight coffee is cold, you'll be landing right outside the Falls. A short transfer will put you in the heart of the Niagara Falls action as you’ll be in front of the famous Maid of the Mist. This tour includes a ticket on this famous sightseeing cruise, getting you right up close to the thundering falls (substitute Niagara Theater in the winter). After a sometimes wet cruise, stroll the city to visit various aerospace and science museums, casinos, observatories and much more. For the only panoramic view of all three Niagara Falls, including the American Falls, the clear choice is Niagara Falls Observation Tower. Extending out dramatically over Niagara Gorge, the architectural wonder affords unobstructed views of the wild cascades of Niagara Falls, as well as the raging whitewater below. For aviation enthusiasts, visit the Ira G Ross Aerospace Museum. This organization is devoted to the efforts of Western United States during the war years and includes the recently salvaged P39, the Lend Lease, currently under restoration after 50-plus years resting at the bottom of a lake. For children of all ages, perhaps pay a visit to the Wax Museum or the Niagara Science Museum. After working up an appetite, enjoy a VIP Priority Seating at the Tony Roma's restaurant. A delicious meal with just a short wait will fuel you for a short walk to the various casinos where you can indulge in some afternoon excitement. The choices are yours, so plan your day the way it suits you most. You can also choose to upgrade your tour to include a 12-minute helicopter tour of the Canadian side of the Falls. At the end of the day, you'll be shuttled back to the airport. Take a 45-minute snooze on the plane back to Boston.